Basel and Bayern provided an entertaining match to watch, with loads of opportunities (especially during the first half) as promised, and it was only baffling that the scoreline remained at 0-0 until the 86th minute. The first minutes were in fact hectic, with scoring chances for both sides. The tactical battle was a bit as expected. Without Schweinsteiger, Bayern remain somewhat predictable from midfield, too reliant on Ribéry and Robben's endeavours. Tymoschuk and Alaba started off happy to sit back and kill the opponent's counterattacks. With its narrow 4x4x2, Basel didn't mind soaking up pressure, because it played right into their hands and strengths. They would gladly cede possession to Bayern, hoping to catch them off guard with Streller as the focal point for feeding Sharqiri and Frei. Basel seemed a bit overwhelmed at first and Bayern created chances early on, especially through short diagonals from Gomez and Ribéry. However, once the centre-backs settled in, things went much smoother for them. In fact, the match reached a point where it resembled a pairing match, with wingers vs fullbacks, strikers vs centre-backs and central midfielders vs central midfielders. Neither team was willing to commit too many man forward and leave their backline exposed. 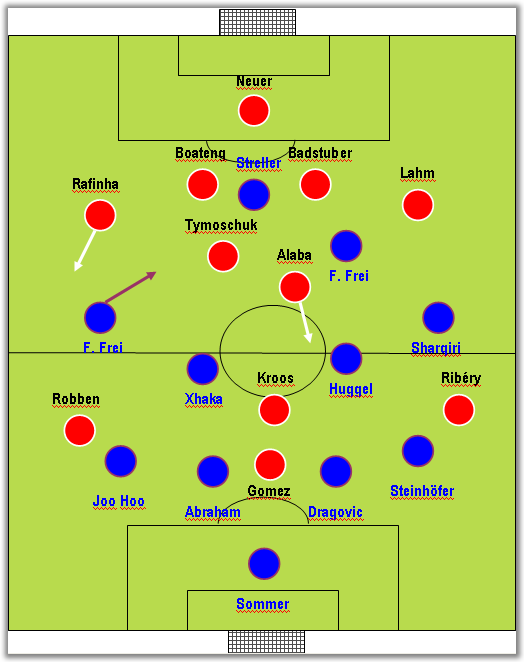 Like Chelsea the day before, Bayern left way too many space behind their right-back and therefore Streller was often eager to lean onto that side, opening up space for either Fabian Frei (excellent working the channels) or Alexander Frei. Actually, it was hard to understand why Basel didn't do that more often, since it clearly caused problems for the make-do central partnership of Boateng and Badstuber. On the other hand, as their home match versus Benfica showed, the easiest way to beat this sort of 4x4x2 is to create overloads on the wings, dragging one of the central midfielders and leaving the middle exposed. Oddly enough, Kroos was reluctant to do just that, which meant that it was harder to open up spaces. With Basel tiring out during the 2nd half, Bayern were happy to take their foot off the gas, since a draw wasn't such a bad result, in their view. Unfortunately for them, Heiko Vögel was spot on with his substitutions, replacing the exhausted wingers with Stocker and Zoua. These two players were decisive for the final result (not just because one scored the goal and the other provided the assist) by bringing with them an extra spring in their steps, shaking things up and providing added incisiveness. In the end, Bayern will regret not scoring and will need something extra that neither Tymoschuk nor Alaba are capable of providing. Basel, in turn, even though they have scored in every away match this season in the Champions League, will have to be willing to endure some early, intense pressure. PS: Both Yann Sommer and Park Joo Hoo delivered excellent performances and it wouldn't be surprising to see them reaching different heights.